THE SKINNY: As a runner, friction sticks are an important part of my "makeup" collection. Julep's new Doublestep friction stick is just as good or equal to the others I have tried, such as Band-Aid's version. While the product itself is pretty nice -- I love the super moisturizing formula that protected and left my skin soft -- the packaging leaves something to be desired. The tube is an odd shape and somewhat hard to manage. The applicator wheel is a little difficult to turn. And the stick wants to slide out of the tube. Plus it is pricey, at $22 compared to about $7 for the Band-Aid brand. KEEP OR TOSS: Keep. But when it's time for more, I'll likely go back to Band-Aid. 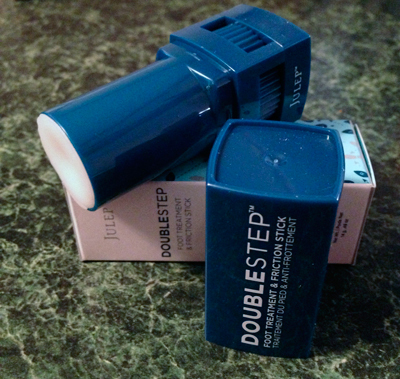 CHECK IT OUT: You can buy direct from Julep and Mavens get a discount. Join here!